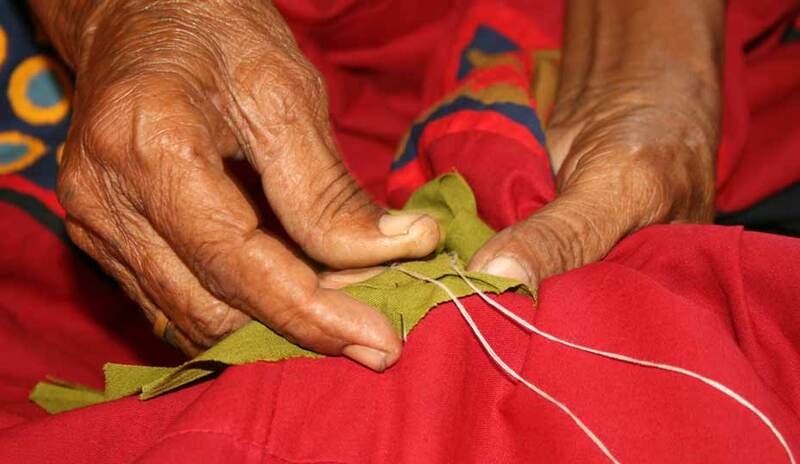 This situation led to the establishment of QASAB in 1997 as an initiative to develop the traditional crafts of these women artisans not only as a viable livelihood option but also to re-create the glory of their traditional craft which had been eroded largely because of the rampant commercialization and gave very little scope for expressing their creativity. The artisans of KMVS re-organized as Producer Groups to manage their activity as artisan entrepreneurs, designing, producing and coming to the market with their craftwork under the name of QASAB. QASAB has been for the last fifteen years re-defining, re-interpreting & re-positioning the traditional embroideries of Kutch, building on the traditional embroidery styles of each of the communities associated with QASAB. One of the major areas of work that QASAB took on was to make distinct the unique identity of each of the ethnic groups and their embroidery styles through the artistic work – so that the beautiful work was not just referred to as generic Kutchi Embroidery. This way, the QASAB products reflect the traditional embroidery styles of Harijan Meghwars, Kutchhi Rabaris, Sodha Rajputs, Mutwas, Dhaneta Jats, and Sindhi Memon –some of the ethnic groups that made Kutch their home in the last few centuries – In the first few decades of commercialization of embroideries, the craft had been referred to as generic Kutchi Embroidery or just ` mirror work whereas, each of the communities doing embroidery work in Kutch had their distinct styles & rich motifs. Today, QASAB is known for its outstanding quality authentic Kutch embroidery, appliqué & patchwork products in craft circles & craft buyers. The embroidery work has been elevated to the status of art too and a few women make exquisite art panels.The QASAB work has been exhibited in major museums, art galleries. The classic collection of QASAB – Hand embroidered Cushion Covers, Bags, Pouches, Leather combined Embroidery Wallets, and Travel Holders are popular gifting & life style products. They are popular inIndia and overseas as well. Around 1200 artisans are currently involved in the QASAB network. The returns from the QASAB products go directly to the makers and the surplus generated from their business after deduction of their running expenses is re-invested in the development activities of their craft and a portion of the money is distributed to its members as dividend based on their contribution by way of work during that period. After establishing the ground for their craft & business development on their own terms, the crafts women have formed their own Producer Company based on co-operative principle. This is the first of its kind company of embroidery craftswomen from different ethnic communities in the country.